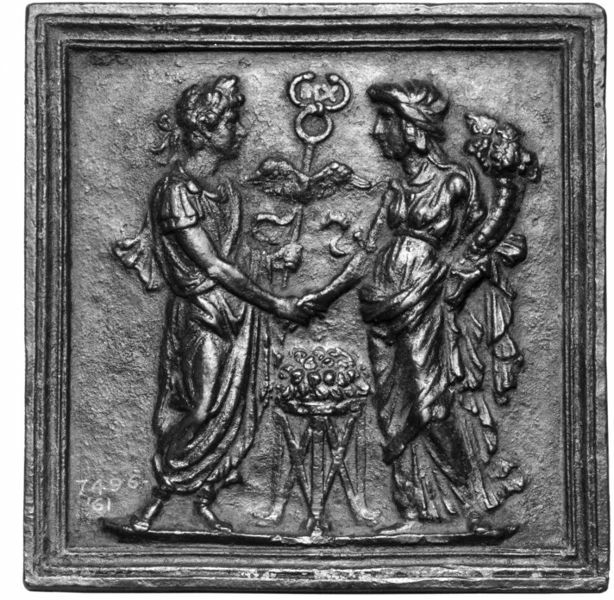 This plaquette most likely depicts an allegorical scene of Augustus and Concordia and is made by Christoforo di Geremia. Christoforo di Geremia was a sculptor and medallist of Mantua, whose name appears also as Christophorus Hierimia, Christophorus de Geremiis de Mantua. Filaretus mentions him in 1460 as one of the best contemporary sculptors. In 1461 he went to Rome, and until 1465 remained in the service of the Cardinal of Aquileia, Lodovico Scarampi Mezzarota; after the latter's death he was employed by Pope Paul II. in 1468 he was entrusted with the restoration of the equestrian statue of Marcus Aurelius which was then in San Giovanni Laterano. After this date no mention of him occurs in contemporary records, and that leads to the assumption that he must have died in the early years of Sixtus IV's pontificate, whose medal was executed by Lysippus, Christophorus's nephew. 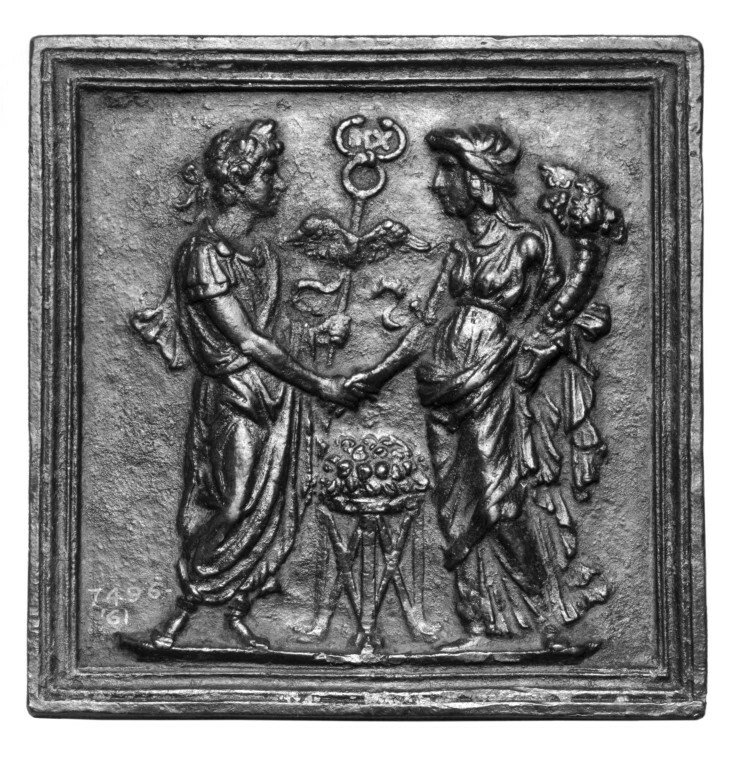 In Roman mythology, Concordia is the goddess of agreement, understanding and marital harmony (Greek version is Harmonia). Her opposite would be Discordia (Greek: Eris). She is usually depicted sitting with a cornucopia (the symbol of prosperity) or a caduceus (the symbol of piece) or a patera (a kind of bowl for ritual ceremonies). Her oldest and pricipal temple was situated at the forum and dedicated by Camillus in 367 B.C as Concordia Augusta. This became a frequent title especially when in the context of agreements between the members of the imperial family. 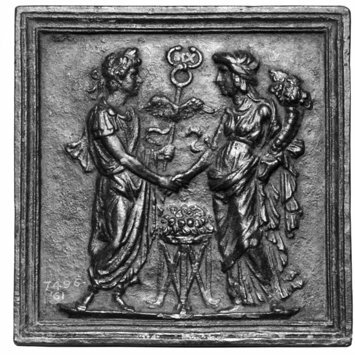 Plaquette depicts the Emperor in a long mantle and wearing a wreath standing on the left holding the caduceus in his left hand; his right clasps that of a draped woman who holds a cornucopia in her left arm. Between the figures is a tripod with a basket of fruit.